What is health economics? | Whatis Series...? Economics is the science of scarcity. 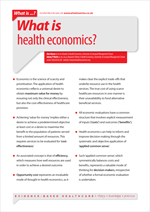 The application of health economics reflects a universal desire to obtain maximum value for money by ensuring not just the clinical effectiveness, but also the cost-effectiveness of healthcare provision. All economic evaluations have a common structure which involves explicit measurement of inputs (‘costs’) and outcomes (‘benefits’).